Terraclime 30 is a soft-sided, protective, multi-purpose pouch designed expressly for the eco-conscious, fashion-savvy consumer. It reduces environmental impact by virtue of its materials—over 95% recycled. All of the fabric is 100% post-consumer Cyclepet®: recycled 16 oz. PET bottles turned into sturdy, water-and-abrasion-resistant material (3.5 bottles in Terraclime 30). 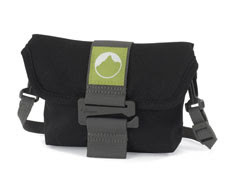 Features include memory card pocket, adjustable/detachable shoulder strap, belt loop, and double-loop hook closure (made of plastic regrind to help reduce waste). Multi-purpose styling makes it easy to carry compact point-and-shoot cameras as well as small personal electronics and gear. A portion of the proceeds from each bag goes to Polar Bear International (PBI) to help in efforts to save polar bear habitats from the impact of climate change. So we decided in light of the polar bear issue and other factors, we really should share the joy, so we have 2 bags to give away. To be eligible, you must be a subscriber both to this blog, musingsbyapple.blogspot.com, and the carrie freelance e-newsletter, which you can sign up with on the home page for carriefreelance.com, you'll see, it's a Constant Contact kind of thing. All current and new subscribers as of September 30 will be eligible. Good luck to the winners! And hey, if you send us your photos with the camera bags featured in the photo, we will publish them on our blogs, etc. Sunrise Advisors: eco consulting, small business services for sustainable businesses, including communications, marketing, coaching, income generation, etc. Carrie's newsletter features guest interviews, movie and book reviews, online discoveries, and other interesting items, including why I love food and hate waiting on line.